The oldest form of paper marbling is suminagashi, the Japanese form of the art, is said to have been invented in 1151, a time when Japan was stepping away from the influence of China and developing national areas of literature, architecture and art. In this form, sumi ink is dropped on the surface of water, a hand fan is used to blow the ink into patterns and then the image is picked up on the paper’s surface. In the Near East, the earliest documented sheet of marbled paper dates from 1447 and comes from Turkey. Few examples this early come down to us because of the fragility of paper, the scarcity at the time as it was reserved for the rich and powerful and because that area of the world has been beset by many wars. Legend has it that manuscripts were torn up in 1220 to provide bedding for the horses of conquering armies. It is from Turkey, the name ebru, comes to this art form. In Turkish style marbling, the paper is first coated on one side with alum [this is what keeps the color from washing off]. A thick liquid, referred to as the size, is made by blending a type of gelatin (carrageenan) with water and poured into a shallow tray. Liquid color in the form of ink or paint is sprinkled on the surface of the size where they float. A tool is used to stir the color into the desired pattern. Most patterns require several colors. The paper is then placed on the surface of the size, alum side down and the design sticks. The excess color is washed off and the paper is hung to dry. Only one piece can be made at a time and each is unique. Marbling in England is spurred by travel. In A Relation of a Journey Begun in 1610 by George Sandys, the author describes the marbling process that he observes in Turkey. That book first appeared in 1615 and Special Collections has a 1637 4th edition. Sir Francis Bacon in Sylva Sylvarum  also mentions Turkish paper marbling. Sir Thomas Herbert, a diplomat observed the marbling process in Persia and wrote about it in Some years travels into divers parts of Africa, and Asia the Great: Describing more particularly the empires of Persia and Industan , first appearing in 1634; Special Collection has a 1664 edition. 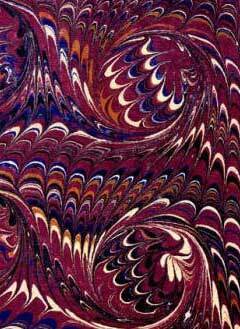 The first book to give a history of marbled paper in Europe is Decorated Book Papers by Rosamond Loring in 1942. Loring was a paper scholar, a paper decorator and collector. Her personal collection now resides at Harvard According to Phoebe Jane Easton writing forty years later in Marbling: a History and a Bibliography , from 1983, “her [Loring';s] work cannot be improved on, only fleshed out and brought up to date." European marbling seems to have flourished first in Italy as early as the 16th Century although Turkish papers were being imported before that time. Easton says that “attempting to reconstruct European marbling history is very much like working an old jigsaw puzzle, some of whose pieces are lost, some disfigured, some misplaced, and others still not turned right side up.” The history of European marbling is a group of stories about individual countries and sometimes individual masters. Of particular interest to us is the history of marbling in both Italy and France in that a large portion of the marbled papers used in books in Special Collections are found on imprints from those countries. Other forms of paper decoration include paste papers and printed papers—both represented in the Book Arts Collection. In the former, binders paste is mixed with color and then paper or the edges of books are brushed or daubed with paste. Designs in the paste are created by drawing a tool or a finger through the paste or using a variety of tools pressed into the paste. Printed papers are exactly that, printed images on paper. This is the one form that produces papers that are identical. All other processes mentioned above are done by hand and are, therefore, unique.